It’s funny that in the portion of Naso, we read about the sacrifices that we read during the 8 days of Chanukah and in the very next portion BeHa’alothekha we read about the Menorah in Chapter 8 of Bamidbar. Obviously these two portions must be connected somehow. Each Chanukah we read about the sacrifices from Numbers (B’midbar) 7:1-89 and 8:1-4, and while the 89 verses of chapter 7 obviously correspond to the gematria value of Chanukah (89), the 4 verses of chapter 8 correspond to the 4 periods of exile. One simple way that these two portions are connected is in the sum of their two names. Naso has a numerical value of 351 and BeHa’alothekha has a final value of 1007, which together sum to 1358, or keter (1000) plus 358, the numerical value of Mashiach. That would be fine and dandy but of little value to us, unless we also knew that encoded into the sacrifices for Chanukah, the festival of lights designed to bring Mashiach, was the date for Moshiach’s arrival. Before we explain about some of the deeper meanings of the laundry list of sacrifices that read about in the portion of Naso, on each of the 8 days of Chanukah and that were to be made by the 12 tribes in the Mishkan or Holy Temple, we should note the complete numerical value of the “Menorah” found in Chapter 8 in BeHa’alothekha is 359, the numerical value for Satan (or for Mashiach in Aramaic). It’s common in sourcing the essential energies that the numerical values represent that we find that the cure and the problem have the same exact value, which is why the Menorah (359) is our cure for overcoming Satan (359) in the same way Moshiach (358) is the cure for the snake (358). Energy is usually depicted as a wave so to visualize this picture a symmetrical wave along the X-Axis of a simple X-Y graph whereby the peaks reach 358 units high and the troughs 358 units low. Superimposing the energies cancels one another out. You have to admit it’s an odd group of items, but with everything in the Torah, there is always method in the madness. (130+70+10+1+1+1+1+2+5+5+5) = 231, as in the 231 Gates of Wisdom, which we know from Abraham’s Sefer Yetzirah are the number of pairs of letters that can be made from the 22 letters of the Alef-bet, which he called the 22 building blocks of the universe. Besides helping us to cancel out the sins that our souls committed when they were joined as one within Adam during the 130 years that he was separated from Eve, the 130 shekels of silver for the plate that we sacrifice each day corresponds to Jacob’s age when he entered Egypt to begin the exile in Egypt. This itself is no coincidence as his 130 years also served to mitigate that self-same sin of Adams. 130 is also the value of Sinai, where the Israelites received the Torah 210 years later. Of course, if we add together the weight of the silver and gold (representing right and left column energies) we get (130+70+10) = 210. By way of further explanation, the 70 shekels of silver correspond to the 70 family members with Jacob who entered Egypt. It also represents the 70 nations of the current exile and the year 70 CE when the Second Holy Temple was destroyed and the current exile began. And while the 10 shekels of gold correspond to the 10 Utterances received at Sinai and the 10 Sefirot (dimensions) of the Tree-of-life. Moreover, while the full weight of metals was 210 shekels corresponding to the 210 years of the Egyptian exile, the value of the word Shekel (ShKL) itself is 430, corresponds to the 430 years of the full first exile from the Covenant of Abraham, which began in 2018 HC and ended with the crossing of the YM Suf and the reception of the Torah at Sinai in 2448 HC. Now, a deeper secret within this weight is that “210 shekels (ShKL)” are equivalent to a numerical value of 210 x 430 = 90,300 or 903 x 100, an 903 is the recognized sum of all the positive integers through 42 and since there is a spiritual tenet that nothing is ever lost, 903 is the full inclusive value of 42, encompassing all the energy of the integers that came before it. Going back to our depiction of energy as waves, we can picture 903 as the sum of the peaks of energy level 1, plus that of energy level 2 all the way through energy level 42. If you recall the Chanukah reading consists of 89 plus 4, or 93 verses. It’s a possible allusion to 903; nevertheless, the word Shekel is repeated 26 times during in the 93 verses of the full reading and not only is 26 the value of the Tetragrammaton (YHVH), but the value of the word shekel (ShKL) spelled out (gematria milui) is 620, that of keter, the highest, crowning sefira (dimension). Then in the often repeated phrase amongst these verses, “Shekel B’Shekel H’Kodesh,” the word H’Kodesh (HKDSh) likewise has the gematria milui (spelled-out-value) including the kolel of 1000, which, as stated above is also representative of keter. Therefore, the phrase Shekel B’Shekel H’Kodesh can read as “the crown in the crown at the crown,” or “keter of keter of keter,” which is the highest level imaginable. All this reiterates all the potent energy available in these connections to the YHVH and to keter of keter of keter, but how does it relate to date for the arrival of Moshaich? To begin with, the word H’kodesh in gematria milui sofit has the numerical value of 2008, as in the recent year 2008 CE, when from a financial standpoint the world began its implosion, when the world’s stock markets declined a collective 42%. 2008 CE would be Of course, this is 10 years before the prophesied time frame of 2017-2018 CE (5778 HC), and could be accounted for with the kolel, but there is much much more that ties the sacrifices more precisely to this very specific date. For example there are 41 combined occurrences of the 3 words in the phrase Shekel B’Shekel H’Kodesh found in the reading of the sacrifices and their average value is ((15 x 409)+(12×430)+(14×432))/3 – 3 (kolel) = 5778, as in the year 5778 HC (2018 CE). But possibly even more telling, of the 5845 verses in the Torah, 184 phrases wholly within verses or 3.14% of the total verses, have a value of 2019, as in 2019 CE, the first year of the new era of Mashiach as prophesied by the tzaddikim. And of these 184 phrases, 35 are within the 93 verses of the sacrifices, an unfathomably large percentage. Moreover, 184 is the numerical value of Pkad, which chazal has independently connected to the coming of Mashiach and which we wrote about in a previous blog. So of the 93 verses of the sacrifices, fully, 57 (6, 16, and 35) are either connected to the year 2017 (5777), 2018 (5778), or 2019 and another 41 times specifically to 5778 through the repeated occurrences of shekel b’shekel h’kodesh. There’s no statistical way that this is coincidence. And if you grabbed a calculator and did the math, you saw that 57/93 = Phi (.6180…). Even more precisely, it worked out as 57/93 = .612903, or 612 (brit/covenant) and 903, and allusion to the mem-bet (42-Letter Name) as described above. This is what connects the two portions read after Shavuot, when we’ve just received the Torah in marriage once again. It’s clear that as we can every Chanukah, 6 months earlier, we can also connect now through the subliminal connections programmed into the sacrifices to keter, to the geula and to the coming of Moshiach. Every 6 months, we get this wonderful opportunity to connect with the Tree-of-life reality, and at the end of 66.6 jubilee years in 5778, we will get the ultimate opportunity to connect to it permanently. But it is not some G-d given right. It is an opportunity we’ll have to earn. We’ll have to make sacrifices. The 4 verses in Chapter 8 of Bmidbar (BMDBR, which incidentally permutes to (DBR MB, say the 42) corresponds to the 4 exiles. And at the end of the 4th exile, we must make sacrifices. Each of the 4 types of animals of the sacrifices had a specific purpose to help the 4 types of man. But the gold and silver had other significance too: to open up the 231 Gates of Wisdom for us. The complete value (standard plus ordinal) of silver, representing gevura/judgment or left column energy is 203, as in the first 3 letters of the Torah. And the complete value of gold, representing chesed/loving-kindness, or right column energy, is 28, as in the 28 letters of the Torah’s first verse. All 12 tribes were instructed to give both gold and silver in the weights/proportions described above for the sacrifices. And just as (130+70+10+1+1+1+1+2+5+5+5) = 231, representing all the sacrifices, the complete values of gold and silver together (28 + 203) = 231 as well. And not only do these 231 Gates correspond with the 231 letter pair combinations amongst the 22 letters of the alef-bet but 231 is also the sum of the positive integers through 22, just as 903 was for 42. Gold and silver, money, assets, mean nothing in the achievement of the Tree-of-life reality–it can’t be purchased, but chesed/loving-kindness, and helping one another, these are the commodities that count. Remember, all the 12 tribes gave equally. The sacrifices are made for the community. It took more than Moses; it took unity to reach the Tree-of-life opportunity last time. And also to build the Holy Temples. And it was disunity that blew the opportunity and crumbled the Temples. These are the journey(s) of our lives. In the Torah portion Masei, we encounter the list of the 42 journeys the Israelites took during their 40 years in the desert including exiting the exile in Egypt at Pi-Haratha to entering the Promised Land. The tzaddikim, including most notably the Baal Shem Tov, have told us that these journeys parallel the journeys each of us must undertake to return our souls to G-d in purity, and also that these mimic the journeys that we all take collectively from the moment of Creation to the geula (final redemption). The 42 places were separated from each other by the prefixes to (Bet) and from (Mem) and also by the word journey (VYSAV). The prefixes M and B, together have the value 42 and also reference the 42-Letter Name (the Shem MB), while the word journey (VYSAV) is repeated 42 times in this section of the Book of Numbers, chapter 33. It is repeated another 17 times, the numerical value of the Hebrew word tov, meaning good, throughout the rest of the Torah, for a total of 59 times. The word journey (VYSAV) is interestingly constructed, as it can be split into VYS of numerical value 76 and then AV also of numerical value 76, and when we multiply 76 x 76 we get 5776, plus 2 for the kolel of the two 76’s gives us 5778, the year the tzaddikim have indicated for the arrival of the Moshiach (Messiah) and the geula. 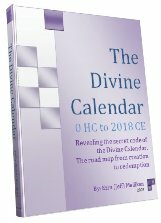 This makes sense to readers of this blog and of “The Divine Calendar” and “There’s Nothing Random in the Universe,” as we’ve already seen a preponderance of evidence for the date 5778 (2018 CE), but within the context of the 42 journeys, let’s look back to Creation, where the 42 Letter Name comes from (the first verse of the Torah and the first 42 letters of the Torah). Before we do that we should mention that when we add the 14 times the word “will journey” without the final vav (VYSA) to the 59 times the word journeyed (VYSAV) is used, we get a total of 73 times in the Torah that the word “journey” is mentioned, which is interesting because the small gematria value of the upper 42 Letter Name is 159 and that of the lower one is 173, and the unification of the two brings about the redemption. This is significant for several reasons: 1) 73 is the numerical value of the sefira/dimension of Chochma (wisdom); 2) The total gematria of the Torah’s first verse is 2701, which is equivalent to the sum of all the positive integers through 73; and 3) The number 9 divided by the written out small gematria of the 42 letters is equal to 73.1415777, a graphic combination of the number 73, the mathematical constant Pi (3.14159…) and the year 5777 (5778). Thus through the 73 times the word journey is utilized in the Torah, the journey is anchored at the moment of Creation, and extended outward from there, theoretically ending in 5778, So let’s take the year 5776 derived directly from the word “journeyed (VYSAV)” and we see that when we take it back to Creation through 5776/42 we get 137.5238… with 137 being the numerical value of Kabbalah, meaning “to receive” and both 52 and 238 (Rachel) represent Malchut. It’s all connected, as explained in “The Genesis Prayer,” 137 and 73 are both reciprocals of one another as 1/73 = .0137 and visa-versa, and the total gematria value of the torah’s first verse, 2701 is 73% of that of the 42-Letter Name, 3701. 137 is also the numerical value of the name of the angel of the Torah, Yofiel, and like all the angels represents a specific energy that we feel, yet cannot begin to grasp. Likewise, Metatron, chief of the Archangels, guardian of knowledge and the Throne of G-d, has the numerical value of 314, the same as the mathematical value of Pi (3.14159265358…). He is the key to all Creation, permeates all our existence, and yet is totally beyond our comprehension. When G-d created our world, he first set forth these specific energies as a basis for matter and life to feed off of, a dynamic scaffolding of sorts. It’s not coincidence that physicists see the universe as 13.7 Billion years old. Within the name Metatron (MTtTtRVN) we have the double letter tet-tet, which the Zohar explains has the numerical value 18 and thus is chai (life), but this is also the marker for the end of our cycle, for as I explained it to my children, the end of the time-out Adam was given as punishment for forsaking the tree-of-life for the momentary pleasure of the tree-of-knowledge of good and evil. 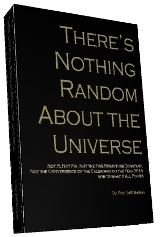 For you see, as fully explained in the book “There’s Nothing Random in the Universe,” the other primordial mathematical constant that guides life and the universe, Phi (1.61803399…), when raised to the power of 18, in other words (Phi X Phi X Phi X Phi X Phi X Phi X Phi X Phi X Phi X Phi X Phi X Phi X Phi X Phi X Phi X Phi X Phi X Phi), equals 5778.000. And the letters that are left in his name (MRVN) add up numerically to 296, that of “the Earth (HERZ),” the final word in the Torah’s first verse, the verse which, as detailed in “The Genesis Prayer,” also equates to Pi (3.14155) through a simple gematria operation and also in a dozen other ways. And while we know from “There’s Nothing Random in the Universe” that Pi is also intimately connected to the date 5778, we can also apply the same formula we did with Phi and see that Pi raised to the power of 18 can be divided by 666.52 squared to equal 2000, the Hebrew year 5760, which is 18 years prior to 5778 (2018 ce), and is the year that Rav Abraham Azulai of blessed memory advised the period of Oy and Ashray would begin. These are the journeys of chai (life), our individual lives and our collective life as a people. In the Hebrew days of the week there are collectively 28 letters, connecting them to the 28 letters of the Torah’s first verse as well, and they add up to exactly 3000 in gematria, as explained in the dailyzohar.com. If we take the 7th day as “the seventh (HShBYAY)” instead of Shabbat, then the total gematria, including the kolel of 6 for the 6 preceding days, is 2701, the same as that of the Torah’s first verse. By the way, the two variations together, 2701 + 3000 + the 7 days = 5708, the year Israel became a nation, 70 years before 5778, with 70 being the expansion of the 7 days through the 10 sefirot (dimensions). Every week is another opportunity to connect to the full energy of Creation through redemption. Every week that passes is a missed opportunity. Every week we pass through another cycle of 7, another journey, and must ask ourselves what we learned about ourselves that brought us closer to G-d, through awe, love, or appreciation, that brought us closer to ending out time-out. In explaining it to my children when they asked about it, it was simple. You get time-out from your father when you’ve done something wrong because he loves you and wants you to learn from your mistake (with mercy), and when the time out is over, if you’ve been good, realize the error of your ways, and are in a good place, the time out is over; if not, it gets prolonged. And to bring it full circle, the square root of 5778/(7 day cycle) = 28.730… as in the 28 letters and the sum of the 73 integers in the Torah’s first verse, from which Creation stems. But we have the cycles of our years, lives, generations and jubilee years (7 X 7 +1 years) to contend with as well. We must use them all to work on ourselves. 5778 years is a long time-out, for us anyway. Let’s make sure we’re in a good place, have realized the error of our ways and are ready to embrace G-d (Our Father) and the tree-of-life reality when it ends. When the Israelites, left Egypt and stood at Sinai, and last had the opportunity of receiving immortality and the Tree-of-life reality through a reprieve in the time-out, the year was 2448, 66.6 jubilee years before 5778, and 42.4% of the way to 5778. 424 is the numerical value of Mashiach Ben David. There are no coincidences in G-d timetable, His actions, or His Torah. Let’s not let doubts overcome us as they did our ancestors at Sinai. It’s Rosh Chodesh Av, the month controlled by the influence of the Sun, as explained by Abraham, the Patriarch, in the Sefer Yetzirah. This is the Sun, whose surface temperature is 5778 K. Let’s connect to the energy that G-d has given us, and come out of our time-out better for having had lived through it.